As Planning Departments struggle with under resourcing and heavy case loads how do you make the Planning Officer your ally? Chris Pipe, Director of Planning House discussed this in this month’s Northern Insight Magazine . Once you submit an application a planning professional (known as your case officer) is allocated, they seek comment from consultees and neighbours, carry out a site visit and ultimately make the recommendation on your proposal. There can be numerous people commenting on your application, however it’s up to the case officer to decide whether any issues raised are so significant as to influence their decision. Planners inevitably have to make subjective judgements about your proposal therefore working with your case officer can improve your chances of having it approved. I have said previously that some planners are worth their weight in gold and if they have an issue with the proposal but are in your corner hopefully they’ll work with you to find a solution. Your Local Planning Authority is likely to be under resources which can often mean that your case officer will deal with a heavy work load, which along with the pressure of hitting an eight-week deadline for most applications means their time is limited. Don’t presume you’ll be able to get hold of your case officer quickly if you ring or email or that they will be up to speed with your scheme until well into the application process. Your application will be uploaded onto the Councils website so in the first few weeks defer to this for any responses. If anything needs addressing, contact your case officer to discuss their view of the comments. After three weeks I advise contacting your case officer to ensure they have all the information they need, or to see if they’d like to arrange a site visit. However, be mindful that site visits are often done without arrangement, therefore don’t be surprised if the officer declines to meet you. Be aware some officers are helpful and informative, others evasive. Ultimately your case officer is there to process your application and is under no obligation to discuss your proposal with you, meet you on site or to keep you informed of every step in your application. 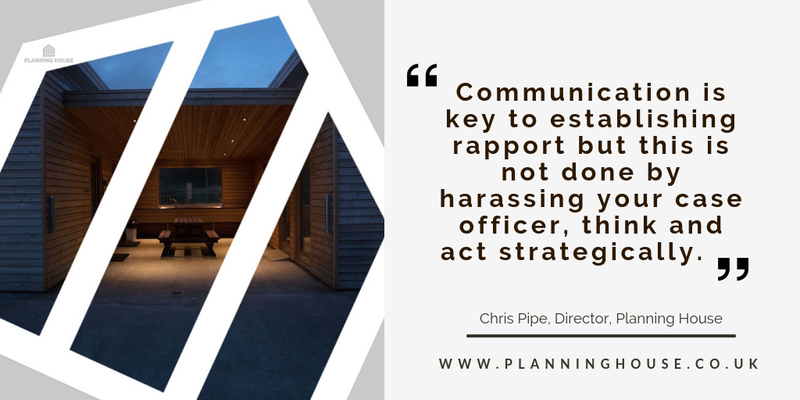 Communication is key to establishing rapport but this is not done by harassing your case officer, think and act strategically. Local councillors can be helpful if things aren’t going well with the planning officer. Some are willing to give a ‘push’ to officers to speed up decisions or communicate with applicants, others will not. However, be aware that this could destroy any rapport you have established with the planner and is therefore a risky strategy. When your case officer is opposed to your proposal, on occasion councillors can call an application to committee for decision, however this procedure varies from council to council. Recommendations are made by the planning officer through a report which brings together any comments received, assesses the proposal against the development plan policies for the area and any other material planning consideration. These reports are generally signed off via a scheme of delegation. Some applications go to planning committee, where Councillors make the decision, whilst informed by the officer’s report they don’t necessarily have to follow the recommendation. Ideally you should aim for a positive recommendation from your case officer, however if they don’t agree with your proposal don’t be agitated or as I’ve heard many times remind the officer that you pay their wages. If relationships do break down or there is an impasse consider instructing a planning consultant to help you. Planning Officers are professionals; however, this doesn’t mean their recommendations are always correct. My ultimate advice make an ally of your planner don’t treat them like a barrier as if their response to your scheme is marginal, developing a rapport with the case officer can potentially increase your chances of securing approval. #planninghelpHow do I apply for planning permission?How is a planning application determined?who makes the planning application decision?